In the farmers market space, one thing that we have found to be an incredible selling point is the quality of the food. In our member markets, we have found there to be no better way to communicate this than to engage shoppers in hands-on, experiential learning. Markets have historically achieved this through food samples in the hopes of getting shoppers to taste the difference in quality. 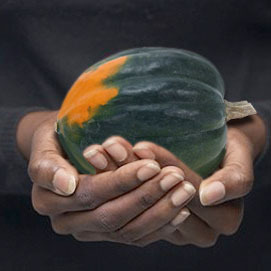 The Georgia Farmers Market Association took this model of experiential learning and redesigned it into Nourish, a 12 week outreach program designed to engage and inform not just the consumer, but the market manager themselves. It takes the effectiveness of offering samples and transforms it into an interactive, on-site cooking experience where shoppers can learn how to create meals using market produce. Nourish offers market outreach coordinators an opportunity to have an in-depth learning experience on how to create engaging food demonstrations at their markets. The curriculum was developed by GFMA’s Executive Director, Sagdrina Jalal and certified RAW foods educator, Carla de Rosa. The course walks participants through methods of preparing food that are best suited for farmers markets and emphasizes meal preparation that is seasonal and local. 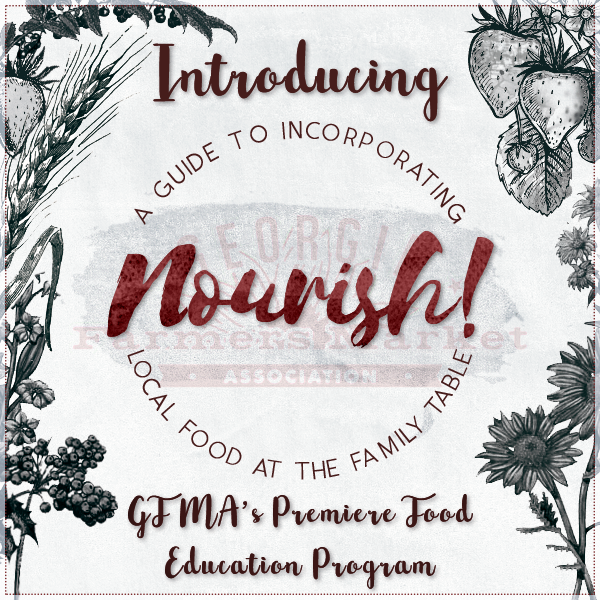 GFMA’s newly developed Food Education Outreach program Nourish will be available to Member Markets the 2017 farmers market season. For more information on Nourish, sign up here! One problem that can directly challenge a market’s existence is its ability to retain the market manager. Market managers serve the market by aggregating local farmers, managing the market’s operations, creating funding opportunities and marketing opportunities. The work of a market manager can be difficult, and many times it follows a learn-as-you-go training model. When there are questions or challenges that present themselves, market managers do not always have someone to turn to. Without the additional layer of support or background knowledge that managers in other fields may have, market managers may face many of their challenges alone. GFMA has observed these challenges and spoken directly with managers all over Georgia to better understand how to address them. We are now happy to introduce our partnership with the State University of New York (SUNY) Market Manager Certification Program! SUNY provides 22 workshop experiences aimed at preparing market managers for the market season and addressing the challenges that they may face. While the modules are scheduled to occur once a week through May, some weeks will have two modules scheduled. Through GFMA’s partnership with SUNY, Georgia will be one of the first states in the country to certify market managers! We are thrilled about this new partnership and cannot wait to begin this step to enhancing the farmers market experience across Georgia. If you would like to receive more information on the FMM Pro Training opportunity, sign up here! GFMA is excited to announce its partnership with the Oldways, a heritage cooking program that aims to inspire healthy eating through traditional diets. Oldways has sought out traditional eating habits from around the world, with certified instructors who engage their community in learning the culturally specific dietary traditions. You may be familiar with the organization for its well known Whole Grain Stamp or the Mediterranean Diet Pyramid. Their aim is to encourage eating practices that are culturally relevant, optimal for good health and good for the planet. To integrate this practice of using cultural foods to improve health outcomes, the Georgia Farmers Market Association and Oldways have partnered to offer the African Heritage & Health program to communities across our state. Their six week course: A Taste of African Heritage Cooking Classes blends nutrition and cultural history with simple, delicious cooking techniques, to inspire a whole new way of eating-through the “old ways”. GFMA will host an Oldways training pilot conducted by Oldways staff this Spring, and is working on funding to sponsor producers and market managers in select communities. If you’d like to stay informed as the training and funding opportunities come available, please fill out an interest form here.